The Irish Supreme Court in Dublin has upheld planning approval for the southern section of the cross-border electricity interconnector. Approval for the project was originally granted in December 2016. It faced a number of legal challenges, resulting in Tuesday's decision by the Supreme Court. However, the northern section of the project does not yet have planning permission. The north-south electricity interconnector is due to link the island's power grids mainly to give Northern Ireland greater access to generating capacity in the Republic. The £250m scheme will involve connecting the two grids via 138km of overhead lines between Moy in County Tyrone and County Meath. The link was meant to be ready by 2017 but has faced a series of planning challenges. Earlier this month, the Department for Infrastructure in Northern Ireland conceded a legal challenge which meant permission for the northern section was overturned. The planning application is expected to be reconsidered soon by the senior official in the department. The official will be able to make a more legally certain decision, in light of new legislation passed at the end of last year. That legislation gave civil servants more legal clarity to make decisions in the absence of executive ministers. Robin McCormick, General Manager, SONI said: "We are pleased that the project has now cleared all of the planning and legal hurdles in the Republic of Ireland and we are hopeful that the same can be achieved in Northern Ireland in the coming months." 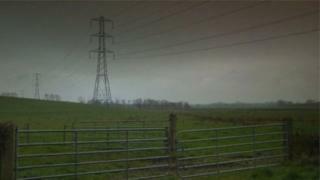 The link is opposed by some landowners and residents who regard the pylons as unsightly and also claim there is a health risk. It was also been drawn into a wider political row about electricity pylons in the Republic of Ireland.